Are you planning an adventurous holiday in Africa? If so, mountain gorillas trekking is one of the best experiences you can have in Uganda’s national parks, Bwindi Impenetrable Forest National Park and Mgahinga Gorilla National Park. 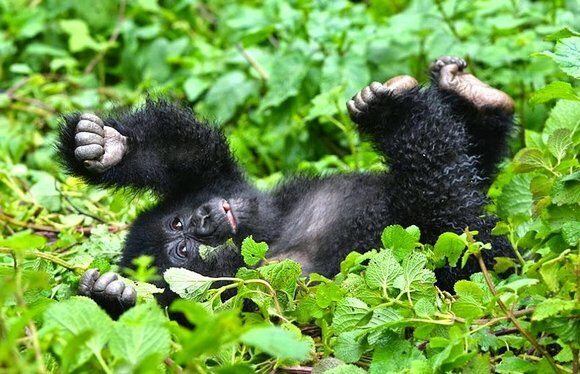 The first question most travelers to these parts ask is “When is the best time to visit mountain gorillas of Uganda”? Mountain gorillas are among the most endangered species on our planet. Today, they find shelter in the Bwindi Impenetrable National Park and the Virunga ranges, which are spread across three countries - Uganda (Mgahinga National Park), Democratic Republic of Congo (Virunga National Park) and Rwanda in Volcanoes National Park. Due to the fact that these primates are highly endangered, visitors are willing to pay a hefty price just to view or track them. The current price for gorilla permits is USD1500 in Rwanda, USD400 in Democratic Republic of Congo and USD600 in Uganda. Although it's regarded as a year-round activity, the best time to visit Uganda on a gorilla trekking tour is during the country's two dry seasons: December to February and from June to July. If you are flexible, we would advise visiting during these times. Because gorillas reside in the rainforest, it is important that you bring along waterproof clothing even during the drier months. Spotting other wildlife in Uganda at this time is also more likely. The drier periods can be ideal for those looking to try out other outdoor activities such as hiking and climbing. Visiting during the low season is appealing to many tourists as the prices for gorilla permits decrease from $600 to $450 to encourage tourists to travel despite the rainy weather. Visiting during this season also means that you will get to enjoy the rainforest with relatively fewer crowds. February and September are also good months for a safari in Uganda since there are fewer tourists visiting and the lodges are not fully booked in comparison to the high season period. Mountain gorilla trekking, as well as chimpanzee trekking, go on even during the rainy season when the national parks are fully in operation. In Rwanda and Congo, the rainy season lasts from late February through first rains start coming in March, April, and May. Many tourists avoid these months as the rain creates unfavorable conditions for jungle trekking. However, during the wet season gorilla locations are more predictable. Much of their sustenance can be found in the lower slopes, where it is warmer and are able to find food easily. Tracking gorillas during the wet season will, therefore, be easier. One of the most important items that should be included in your gorilla trekking gear are hiking boots, rain gears, garden gloves, long-sleeved shirts and trousers, camera and extra batteries, insect repellent, hat and sun glasses. If you’d like to learn more about African wildlife and when is the best time to visit your favorite country and national park in Africa, check out the Africa Travel Journal online magazine. Aside from Uganda, gorillas are also found in Rwanda. Go on a gorilla safari in Rwanda to see these majestic primates in the wild! Budget Gorilla Trekking is a tour company specialised in sustainable gorilla trekking tours in Uganda, Rwanda and the Democratic Republic of Congo.